Solace, Jaq Belcher. 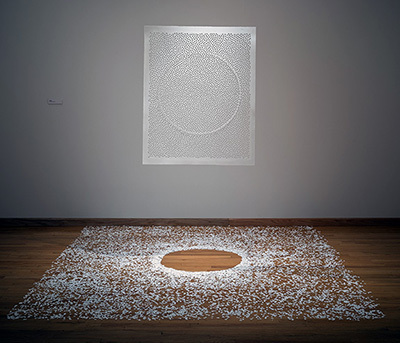 108″ x 108.” Hand cut paper suspended, 12,000 paper seeds. Papercuts features 7 international artists who work with paper as material, intricately and obsessively hand cutting to create narrative or metaphoric content. “The act of cutting becomes a contemplative ritual that is embedded in the practice of the artists in this exhibition,” states organizer Reni Gower. The artists bring a broad range of international perspectives to the contemporary art of paper cutting. Using all manner of tools and paper, the artists create works that range from narrative commentaries to complex structural abstractions. Their works are bold contemporary statements that celebrate the subtle nuance of the artist’s hand through a process that traces its origins to 6th century China. Light, shadow, and color play key roles, transforming this ancient technique into dynamic installations filled with delicate illusions. Papercuts is co-presented by the Department of Exhibitions, Performances and Student Spaces and the Center for Book and Paper Arts, and is sponsored in part by Virginia Commonwealth University and VCUarts.